Nearly 10 rivers, eight of them in Asia, are collectively responsible for discharging at least 4 million tonnes of plastics into the seas every year, as per a report published in the journal Environmental Science and Technology. The Mekong is one of them. The 2500 mile-long lower Mekong river system supports more than 70 million lives and their food security but it’s also one of the dirtiest in the world. For people who depend on the river for fish and food, especially Laos, the vulnerable Mekong is an ecological time bomb waiting to explode. Laos, Thailand, Vietnam and Cambodia, who share the lower Mekong basin, are aware of the perils of climate change and plastic pollution affecting the river. But increasing population pressure, rapid urbanisation and an insatiable hunger for energy and natural resources, is creating a vicious cycle of consumption that is bound to shake up the already fragile ecosystem further. The threat to the Mekong is a clear and present danger. But more evidently so by huge amounts of plastic trash, which also aptly reflects a shift in the lifestyle of an average Lao. If your eyes are drawn toward its shoreline, you will know exactly why it has earned a reputation: plastic bags, single-use straws, water bottles, styrofoam food containers can be found scattered across its banks. Long after the tourists have left, plastic trash remains – for over 450 years. The Laos pattern is similar to Thailand, India, Cambodia, Vietnam, The Philippines, Indonesia: a major shift from traditional and subsistence-based lifestyle, where waste was primarily organic, to an urban, consumer-oriented one has led to an increase in consumption of imported and manufactured goods, which comprise mostly of single-use plastics and non-biodegradable materials. Given that Laos has limited sanitary landfills throughout the country for solid waste disposal — with the only one in capital Vientiane and one each in towns of Luang Prabang, Thakhek, Savannakhet and Pakse — the country has to deal with overwhelming amounts of waste that they can’t handle. There isn’t any formal recycling infrastructure within the country as they send most to neighbouring countries for processing like Vietnam and China. The informal waste management sector has two classifications. First, those who collect recyclables from source. Second, those who segregate recyclables from mixed waste. The recyclables they collect are sold to recyclers the same day they are collected from households, hotels or public buildings. And because, just like India and other developing countries, the waste pickers are not part of the formalised economy, they are usually deprived of the mechanisms that protect them from world market fluctuations or declining prices. That makes them very vulnerable to exploitation. The second category of waste pickers, who collect recyclables from mixed waste, recover soiled plastics which sell for a lesser cost than clear and clean plastics. Then there’s a concept of ‘community dumps’, which are set up inside places where local communities reside. But even these are poorly managed and have just take the litter problem out of sight. In this scenario, most people come up with their own way to deal with waste by either burning, burying it under the ground or dumping it in vacant spaces or worse still, throwing it in rivers. “Trash is free to burn, who would pay money to have it picked up? There is definitely a lack of communication and lack of laws or enforcement. It seems that there is little understanding or acceptance of directly affecting anyone’s health or the earth’s,” said Ginny Coleman, Art Director of Joma Bakery cafe in Luang Prabang. Joma Bakery was my collaboration partners in Laos along with an international NGO called Trash Hero. For instance, in capital Vientiane, there is no segregation of waste at source or any separate bins provided in public spaces. The waste that is collected by municipal authorities is stored in plastic bags before being taken away. The ones that aren’t collected are disposed through open burning or burying under land. Vientiane’s only landfill, constructed and managed by Japanese International Cooperation Agency (JICA), is located 32 km away from the city. However, a transfer station was built midway between the city and landfill and managed by JICA to improve the waste collection. 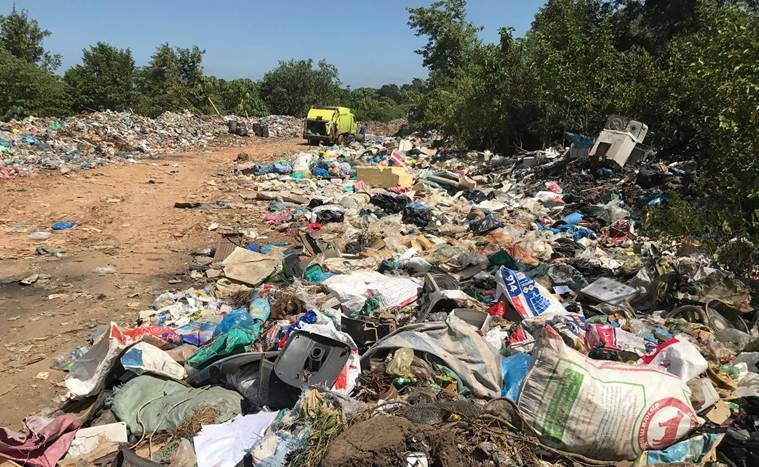 What’s debatable, however, is whether the upgradation of the fleet improved waste collection system from households who had contracts with Vientiane City Office for Management and Service (VCOMS). Plus, there is a growing nonchalance among newly-empowered consumers in Laos, most of whom are basking in the benefits of the polymer industry, about the crucial linkage between their consumption patterns and its consequences on marine ecosystems. “People from the countryside, farmers, market sellers, they see plastic as a sign of progression. It shows progress and even business success to be able to offer your customers the luxury of plastic. To refuse a plastic bag from a vendor is actually considered offensive, as the customer is suggesting the vendor is too poor and that the customer wants to save them money by refusing” added Ginny. Luang Prabang’s case, however, is slightly different. Located in the mountainous region of north Laos, Luang Prabang is a visibly clean town, in part due to the ‘UNESCO World Heritage Site’ tag it earned a few years ago. Walk down any small street through the city and you’d find litter-free areas. The only visible litter you will see are waste that gets collected on the slanting hillside leading down to the rivers. The busy morning market street is where you’d encounter litter, mostly organic waste after the vendors have wound up for the day. But here too, people can be seen walking through and collecting what is useful, often pushing carts full of empty glass bottles for recycling. But why is Luang Prabang cleaner than other Lao cities? Why is Luang Prabang cleaner than other cities? “Luang Prabang’s small geographical area and population definitely help along with the World Heritage Site status. But you will see most main streets and tourist areas have trash bins, so it’s easier to dispose them off,” said Michael, a service staff who works at a backpacker hostel in Luang Prabang. Much like Vientiane, residents of Luang Prabang also keep their waste in bags on roadsides for collection and trucks come to pick it up. “But the difference is that garbage trucks come without fail to take it away,” added Michael. Some say that Luang Prabang residents seem to ‘prioritise upkeep of their city’. At one of the French bistros in the main city area, a local employee said Luang Prabang does not have much garbage littered around because people want to the city to be clean, they like it this way. “Residents here act as guardians. If they see others throw trash, they won’t hesitate to ask them to clean it up,” said Cong Khan Tran. Luang Prabang can serve as a shining example for all other cities in Laos. 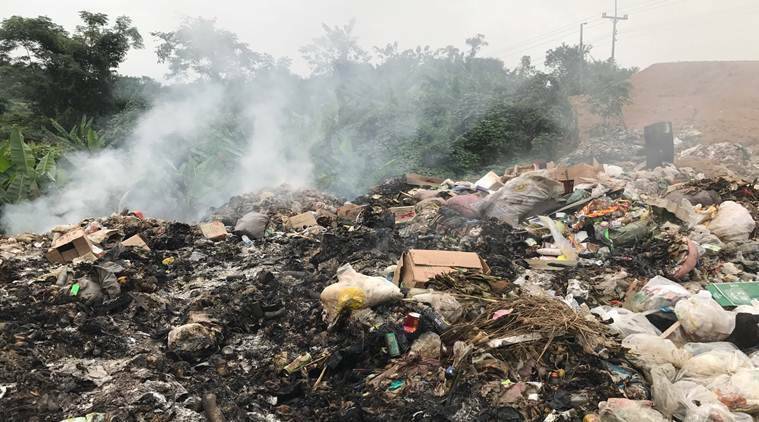 In a country with a small budget and an insufficient legal framework combined with a lack of institutional responsibilities, solid waste management becomes the responsibility of communities and households, which rely on public education campaigns for information. Which is where non-governmental organisations such as Green Vientiane come in as a positive intervention. They have been rallying for a single-use plastic-free environment in Vientiane for some years now. Their recyclable bags are now being sold across cafes and restaurants in the capital. Founder of the NGO Serge Doussantousse, however, isn’t under any false impression that usage of recyclable bags is going to be the silver bullet for all problems. He feels that changing Lao habits and the creation of public awareness about how to dispose of waste materials is going to drive change. Serge suggested a unique way to tackle the plastic problem. With the help of monks, who hold a venerated position in Buddhist-dominated Lao society, he would push across the message. He said monks respect nature, and the people hold them in high esteem. “We need to work with the monks in temples, people in schools, village offices and shops to reach the maximum number of people for our campaign to be successful,” Serge said. As per a UNDP report on ‘Circular Economy and Strategies for Lao PDR’, the country can become a ‘regional recycling and remanufacturing hub’. “Lao PDR can position itself as a recycling and remanufacturing hub in which material cycles are closed. The country can take full advantage of its location on major regional transport arteries like the newly built transit railroads and the Mekong river. It could function as a resource hub, through which resources can be renewed and redistributed,” read the report. 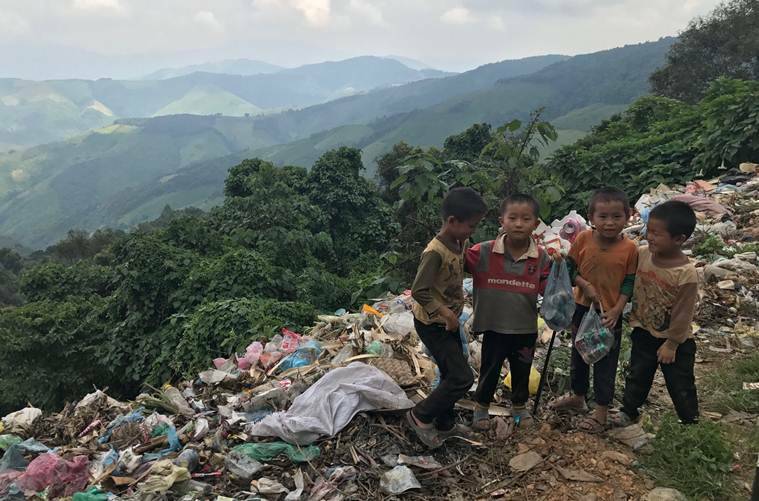 This article is the fourth of a five-part series documenting the individual waste management case studies of India, Thailand, Laos, Cambodia, and Nepal.